Owned and operated by David Singer, we have been providing the Bay Area with bobcat Dirt Digging services since 1993. We operate a wide range of equipment – from dumprucks to Dirt Digging bobcat, demolition, drilling, and trenching machines. We work with many local contractors and homeowners assisting them with their construction site projects. We have many local references from local homeowners and contractors, as well as property management companies. At Have Dump Truck Will Travel, our team of junk hauling professionals are not afraid to tackle any mess or difficult trash pickup tasks. With over 20 years in business, we cater to a wide range of heavy hauling services including site prep and clearing, garage and yard clean up, demolition, trenching, excavation, junk hauling and more. Just let us know what kind of trash removal services you need and we will take care of it from top to bottom. No need to stress about your messy and complicated situation, we take the burden upon our self. 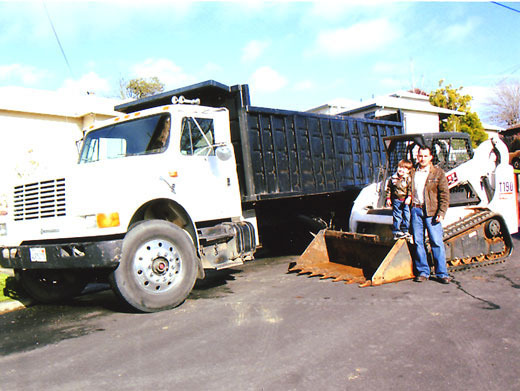 Your property and junk removal needs will be in good hands with Have Dump Truck Will Travel.